Find out everything you need to know about GruntWorx family of Products by exploring a list of Frequently Asked Questions. Click on a question below to show or hide an answer. Q: What assurances do you have that our data and our client's data are completely secure? Document security and data privacy are paramount to the success of our business. Our industry-leading safeguards provide the best possible assurance of the security of all data. Our software runs on servers that are hosted at a highly secure data center that is closely monitored 24x7x365. All communications between your computers and our servers are secured with the same technology used in electronic filing and electronic banking, encrypted and authenticated using a strong protocol (TLS 1.2), a strong key exchange (ECDHE_RSA with P-256), and a strong cipher (AES_128_GCM). We use a DigiCert SSL Certificate and server-gated cryptography for strong encryption of all communication to and from our application services. We will never contact nor solicit your clients for any reason. We will never sell or rent any information on their source documents. All your data is stored in the U.S., and is never accessible by anyone or any computer outside of the United States. Ever. As noted in our Privacy Statement, client records may be viewed or accessed only for the purpose of resolving a problem, support issue, quality concern, suspected violation of GruntWorx’s User Agreement, or as may be required by law. Select employees permitted to view this data have passed extensive background checks, are located in secure areas within our offices in the United States (accessible only via secure passkeys), are bound by stringent confidentiality agreements, and are fully insured. GruntWorx products are also IRC Section 7216-compliant. Tax Professionals using GruntWorx products in the preparation of a return are not required to have clients sign a written consent to use or disclose tax data. The use of the GruntWorx products is permitted as a tax preparer to tax preparer disclosure described in Treasury Regulations Section 301.7216-2(d)(1) since all of GruntWorx service providers are located in the United States and GruntWorx Populate provides an auxiliary service in connection with the preparation of tax returns that does not provide substantive determinations or advice affecting the tax liability reported by taxpayers. We hope this gives you confidence that GruntWorx manages this sensitive data with the utmost care and integrity. Q: How do I download the completed PDF and Excel files? From the Dashboard, click on the client name to access the “Client Details Page”. Click on the “Processed Files” tab. Or, click on the “Download all” button found at the bottom of the page. From the “Processed Files” tab on the Client Details Page, open and save each of the files using the “Save As” function in each document. From the dashboard check the box on the left of each of the clients you wish to download. Select the “Download Completed Files” option, confirm the selection and save to the desired location. Note: To download all client PDFs in your account, this process will need to be repeated for each page of clients. Use the page control buttons on the right, above the header bar or below the client list, to navigate between pages of clients. Q: How do I create multiple client records in GruntWorx products (batch upload)? To create several new records at once, upload a CSV spreadsheet of your clients’ identifying information, including “First Name”, “Middle Initial”, “Last Name”, and “Client ID”. Note: The CSV file should not contain these fields as headers; only the client information in separate columns following the above sequence. The maximum number of client records per upload is 500. You must complete each field under the First Name, Last Name, and Client ID columns for every client to create a valid file. Middle Initial is optional. No field may include commas. Also, if including a Middle Initial, make sure it is less than 3 characters long. Any entry in the Middle Initial field greater than 3 characters will fail. Q: When I download the file and 'print-to' my DMS, why do I lose the bookmarks? When you ‘Print to’ a DMS, it only sends the original file pages to the DMS, and leaves out any bookmarks, notes, annotations, etc. If you ‘Save to’, ‘Copy to’, or drag-and-drop the files into your DMS folders, it will keep the bookmarks. Q: Can I print out the pages in the order of the bookmarks? If you choose to repaginate organized documents, GruntWorx Organize will change the order of the input tax documents in the organized output file to match the order of the bookmarks. From there, printing the pages in the PDF will match the order of the bookmarks. You can also use the standard Microsoft keyboard shortcut to select all bookmarks. Click on any bookmark. Then use the keyboard shortcut <Ctrl> A to select all bookmarks. After all the bookmarks have been highlighted, Right-click the mouse and select Print on the menu. Q: Are there any limits on the filesizes that I upload to you? Currently, the size limitation is 150MB per PDF and a maximum of 15 files per submission (13 for Lacerte Populate submissions). For PDF’s larger than 150MB we recommend you split the documents between two or more PDF’s, taking care not to make the splits in the middle of Consolidated 1099s or multi-page K-1s. Q: What are the ideal settings to use when scanning documents? To achieve optimum quality on the scanned documents, scan documents at a minimum of 300dpi and with the black & white setting. For best results, scan original source documents – not copies or faxes. Q: Can I use symbols, like ampersands, in my PDF file names? Some PDF filenames may cause an issue when those files are submitted to GruntWorx products. Using the following symbols in the filename of a source PDF document is known to cause issues: ampersands ( & ), apostrophes ( ‘ ), and blank spaces. Renaming the PDF file and eliminating these symbols will allow the PDF to go through GruntWorx products without issue. Q: Why can I only attach 15 files to a client… what if I have more than 15? Currently, up to 15 PDF’s can be submitted for a single client (13 for Lacerte Populate submissions). You can use any PDF writing/editing software tool to combine PDFs if you have more than the maximum files allowed. Q: How do I save GruntWorx-organized PDFs into Thomson Reuters FileCabinet CS without losing the bookmarks? Select “Object – Create from File” from the “Object” drop down menu in the top menu bar. Once you open your document in FileCabinet CS there will be a series of buttons on the left. Click the second button, called “Bookmarks”. This will display all of the bookmarks created by GruntWorx. Q: What is GruntWorx Organize and Organize Lite? GruntWorx Organize is a web-based application that enables tax professionals to standardize workflow by automatically organizing and bookmarking their clients’ tax return data. GruntWorx Organize converts a client’s paper and digital tax documents into a well-organized, electronic PDF file: indexed, accessible, editable, and ready for faster, more accurate data entry and review. Organize Lite is an economical option providing the same service as the Organize product but without benefit of human validation. Q: What are the benefits of using GruntWorx Organize/Organize Lite? GruntWorx Organize products save a tax preparer valuable time during tax season. With an automated and standardized method for organizing client source documents, your staff can eliminate time-consuming manual sorting while still being able to quickly find and review any client document. GruntWorx Organize products require no knowledge of tax documents, making it easy for support staff to scan and upload the client source documents – freeing tax preparers to focus on higher value activities. Q: What makes GruntWorx Organize products unique? The GruntWorx family of products are the first web-based applications to read and classify data from paper-based forms and PDF files with unprecedented accuracy across thousands of variations of IRS documents. GruntWorx Organize products are easy to use, provide absolute security of client data, and are extremely affordable – an unmatched value proposition for accountants. Furthermore, the products require no training. There is no software to install in your office or on your PC. Try GruntWorx Organize free today. Q: How does GruntWorx achieve such high levels of accuracy across such a broad range of tax documents? By developing advanced patented technologies, our multi-disciplinary engineering team has solved the problems that have plagued early attempts to automate tax document processing. Our document image processing technology optimizes the quality of real-world document images, including background colors, gray zones, speckles, streaks, rotated pages, etc., without any effort on the part of tax professionals. We use pattern recognition, not simple OCR, to accurately identify each source document.from thousands of different tax forms. Combine all of this together, and you have a solution that meets the extremely high levels of accuracy required by the tax profession. Q: What are GruntWorx Organize system requirements? GruntWorx Organize products require only a PC with an Internet connection and a scanner. No additional equipment or software is required, as all image processing occurs on the GruntWorx secure web servers. Q: What types of source documents does GruntWorx Organize read? GruntWorx Organize recognizes thousands of variations of IRS government forms, tax organizers, and brokerage statements. GruntWorx Organize will even recognize and categorize blank pages, back pages, and handwritten notes! Q: What tax and document management software does GruntWorx Organize/Organize Lite work with? GruntWorx Organize and Organize Lite work with all tax and document management software because they are web-based applications that delivers a standard Adobe PDF file. Q: How much time does GruntWorx Organize/Organize Lite require to process a job? GruntWorx Organize processes a typical return within 1 hour. During peak tax season returns may take up to 1 business day for processing. GruntWorx Organize Lite returns take just minutes to process. Q: How can I try GruntWorx Organize Products? 3. Shortly thereafter you will receive an email message confirming your registration – and free credits for you to test the product! Q: What is GruntWorx Populate? GruntWorx Populate is a web-based application that extracts tax data from scanned tax documents and populates the data into the leading tax preparation software packages. GruntWorx Populate also converts your clients’ scanned tax documents into an organized, bookmarked PDF file, facilitating faster data review. Q: What is the difference between GruntWorx Organize and GruntWorx Populate? GruntWorx Organize automatically identifies and organizes scanned tax forms into a single, bookmarked PDF file that can be used for data entry and review. GruntWorx Populate, in addition to providing the bookmarked PDF, extracts data from the source documents and imports the data into the leading tax preparation software packages. Q: Which tax preparation software packages does GruntWorx Populate support? GruntWorx Populate currently integrates with Drake Software, Thomson Reuters’ GoSystem Tax RS, CCH ProSystem fx Tax, UltraTax CS & Intuit Lacerte. Q: Does GruntWorx Populate support prior tax years? No, GruntWorx Populate supports the current tax year only. GruntWorx Organize and Trades supports both current and prior tax years. Q: How can I get started using GruntWorx Populate? GruntWorx Populate integrates with Thomson Reuters’ GoSystem Tax RS, CCH ProSystem fx Tax, UltraTax CS and Intuit Lacerte. To learn more and register for a free demo, please contact GruntWorx sales at 1.877.830.6059 x2. Q: How is my clients' data secured? We have engineered our systems to achieve the highest levels of accuracy and security. All communications between your computers and our servers are secured with the same technology used in electronic filing and electronic banking, encrypted and authenticated using a strong protocol (TLS 1.2), a strong key exchange (ECDHE_RSA with P-256), and a strong cipher (AES_128_GCM). Our servers are hosted at data centers in the United States. All your data is stored in the U.S., and is never accessible by anyone or any computer outside of the United States. Ever. Q: Are GruntWorx products IRC Section 7216 compliant? Yes. Tax Professionals using GruntWorx products in the preparation of a return are not required to have clients sign a written consent to use or disclose tax data. The use of the GruntWorx products is permitted as a tax preparer to tax preparer disclosure described in Treasury Regulations Section 301.7216-2(d)(1) since all of GruntWorx service providers are located in the United States and GruntWorx Populatevides an auxiliary service in connection with the preparation of tax returns that does not provide substantive determinations or advice affecting the tax liability reported by taxpayers. Q: How long are my organized PDF's kept on your servers/available to me on my online account? We will keep all data on our servers (unless you choose to delete them) until the end of the calendar year following the tax preparation period. For example, files uploaded on 2/15 will be available through 12/31 of the same calendar year, at which time the files will be deleted from our servers. Q: What happens if I forget my password? How will you know it's me? There is a “Forgot your password?” link on the login page. Simply enter your email address on the “Forgot your password” page, and you will be sent an email to reset your password. Or you can send an email to support@gruntworx.com, and we’ll be happy to reset your password for you! All you have to provide is the unique email address you signed up with. Q: What if I forget the email address that I signed up with? You’ll need to remember the email address you signed up with, as that is one of our security measures. We cannot reset any passwords without the correct username (which is the email address you signed up with), and if you forget it, you’ll need to ask a firm Administrator to check your email address on the User tab of the Admin Settings screen. If you are the Admin and can’t remember your email address, you’ll have to sign up with a whole new account with a new email address. Q: Is all the data stored in the U.S.? Can it be accessed by people or computers outside of the U.S.? All your data is stored in the U.S., and is never accessible by anyone or any computer outside of the United States. Ever. Q: How can I make sure that I am adhering to Section 54.1 of the California Board of Accountancy Regulations when using GruntWorx products? The firm may from time to time, and depending on the circumstances, use third-party service providers in serving your account. We may share confidential information about you with these service providers, but remain committed to maintaining the confidentiality and security of your information. Accordingly, we maintain internal policies, procedures and safeguards to protect the confidentiality of your personal information. In addition, we will secure confidentiality agreements with all service providers to maintain the confidentiality of your information and we will take reasonable precautions to determine that they have appropriate procedures in place to prevent the unauthorized release of your confidential information to others. Furthermore, the firm will remain responsible for the work provided by any such third-party service providers. Q: I am a Drake Tax Software user. How can I use GruntWorx? For Drake Tax Software users, because GruntWorx is hosted from within the tax software itself, you will be registering with Drake Tax Software, rather than through the GruntWorx website. For an overview of the Drake GruntWorx integration, please use this link www.drakesoftware.com/products/gruntworx. For videos that walk you through the process, please click on the following www.gruntworx.com/resources/videos and you can sign up for a Webinar at www.gruntworx.com/resources/webinars. You can also discuss your free trial with Drake Software Support at 828-349-5505 or GruntWorx Sales at 877-830-6059 X 2 or contact us by email at either GruntWorxsupport@drakesoftware.com or Sales@GruntWorx.com. Q: How do I create a new client record for GruntWorx Organize or Populate? To create a single new client record, simply click on the “Add/Import Clients” dropdown, upper right on the Dashbord, and click “Add New Client”. The client ID is a unique ID number that you create. The client ID must not include special characters. For Populate returns, you must use some form of the client ID that exists in your tax software. For GoSystem Populate users, the client ID must be identical to the GoSystem Locator ID. To create several new records at once, upload a CSV spreadsheet of your clients’ identifying information. · Following the pattern and rules described on the “Import Client” panel, create a spreadsheet with your client details. · Save the spreadsheet with a CSV file extension. · Click the “Choose File” button and browse to find and upload your CSV client file. 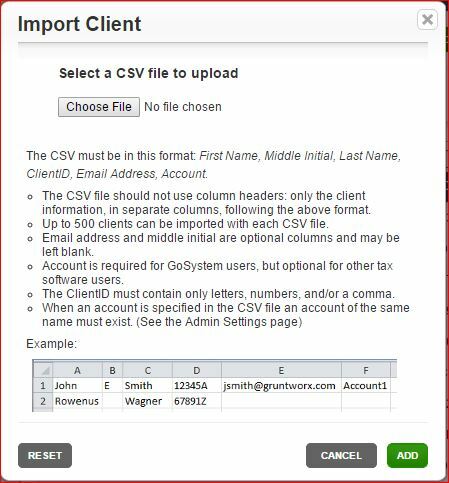 To create several new records at once, upload a CSV spreadsheet of your clients’ identifying information, including “First Name”, “Middle Initial”, “Last Name”, and “Client ID,” (or “Locator ID” for GruntWorx Populate users). Note: The CSV file should not contain these fields as headers, only the client information in separate columns following the above sequence. The maximum number of client records per upload is 500. You must complete each field under the First Name, Last Name, and Client ID columns for every client to create a valid file. Middle Initial is optional. No field may include commas. No field may include periods, apostrophes or &. Also, if including a Middle Initial, make sure it is less than 3 characters long. Any entry in the Middle Initial field greater than 3 characters will fail. Q: How do I submit a GruntWorx Organize return? 1. Select: Add your client to the GruntWorx Dashboard, Click on the client name to select. 2. Scan and Upload: Using a standard document scanner, scan your client’s paper documents into PDF files, and use the upload button or drag and drop your PDFs to the Source Files tab on the Client Details page. 3. Send: Click “Process” to send the data to GruntWorx Organize for processing via secure Internet connection. After the data is processed by GruntWorx, you can view and download the organized PDF from the “Processed Files” tab. Q: How do I submit a GruntWorx Organize Lite return? Submit and retrieve returns using the “Org LITE” link at the top of the Dashboard. This economical and speedy option has its own submission screen designed to return bookmarked and organized PDFs to you in minutes. Once you’ve accessed the Org LITE page, see the “Tour” tab for simple step-by-step instructions. Q: How do I submit a GruntWorx Populate return? GruntWorx supports the population of the following brands of tax software: GoSystem Tax RS, ProSystem fx, UltraTax CS, Lacerte and Drake Software. Drake Software returns are submitted using a link from within the Drake Tax software. Registration is available on the Drake Tax Software Support site. GruntWorx Populate submissions for all other tax software supported requires a bit of setup and in some cases, the installation of the GruntWorx Agent software. Please consult the Quick Start Guides or your sales representative for details. Q: Do I need to organize my source documents before scanning them? Absolutely not! Documents do not need to be organized, nor do separator pages need to be inserted prior to scanning. However, for best results, multiple documents should not be combined on a single page, and multipage documents should be kept together in logical order. To achieve optimal quality on the scanned documents, scan documents in 300dpi and black & white. For best results, scan original source documents – not copies or faxes. Some PDF filenames may cause an issue when those files are submitted to GruntWorx products. Using the following symbols in the filename of a source PDF document is known to cause issues: ampersands ( & ), apostrophes ( ‘ ). Q: Why can I only attach 15 files to a client... what if I have more than 15? Q: Are there any limits on the file sizes that I upload to you? Q: What if pages in my PDF are upside-down or sideways? No problem! GruntWorx products will automatically rotate all upside down (180 degrees) and sideways (90 degrees and 270 degrees) pages to the proper page orientation during processing. However, if a scanned document is skewed more than 10 degrees from any of these positions, page orientation will not be corrected and data will not be extracted for GruntWorx Populate users. Q: Is the order of the client documents customizable in the organized PDF? will change the order of the input tax documents in the organized output file to match the order of the bookmarks. Because the source documents will be in the same order of the bookmarks, you will be able to use the page buttons in any industry-standard PDF program to navigate between bookmarked pages – rather than paging through the original source documents, as they were scanned. However, by repaginating the organized documents you will lose visibility of the original order of the scanned documents. To set your account to automatically repaginate all GruntWorx Organize output files, go to “My Account,” then to “Edit Preferences,” and mark the “Repaginate Organized Documents” checkbox under the “Preferences” heading. Q: How do you handle client data in their own handwriting (not on an organizer or government form)? Though GruntWorx products recognize handwriting and classify handwritten notes as “Handwritten Notes; Poor Quality,” neither product is able to read the handwriting. Forms that contain important identifying information that is handwritten may not be properly classified and will not extract tax data. Q: Do organizer pages need to be included in the scanned papers? GruntWorx products will classify and bookmark organizer pages under the bookmark “Organizer,” so you can include them in your original source document input file. Q: What do you mean when you say the organized document is 'editable'? The bookmarked and categorized PDF file that is returned to you after GruntWorx processing is a standard format PDF file, and is as fully editable as any other PDF file, using software such as Adobe Acrobat, etc. Q: What is the advantage to having two monitors? Using two monitors as an extended desktop will allow you to have the organized PDF open on one monitor, and your tax prep software open in the other, allowing for easy navigation through the tax documents to create faster, more accurate data entry. Q: How do I download the completed PDF & Excel files? •	From the Dashboard, click on the client name to access the “Client Details Page”. •	Click on the “Processed Files” tab. •	Or, click on the “Download all” button found at the bottom of the page. •	From the “Processed Files” tab on the Client Details Page, open and save each of the files using the “Save As” function in each document. •	From the dashboard check the box on the left of each of the clients you wish to download. •	Select the “Download Completed Files” option, confirm the selection and save to the desired location. Q: How do I save GruntWorx-organized PDFs into Intuit Lacerte DMS without losing the bookmarks? Select “Tools – Options” from the “Options” drop down menu in the top menu bar. In the DMS Options window, make sure the checkbox under “View Options,” marked “View PDF files within DMS (provides annotation capabilities),” is unchecked. After performing these simple steps, the GruntWorx-organized PDFs saved in Lacerte DMS will open in a PDF writer/viewer, rather than in DMS. However, you will lose your ability to annotate using DMS tools. If you have an industry-standard PDF writer, you will be able to use the annotation tools provided therein. Q: Do I need to wait until I've received all of my client's source documents before I use GruntWorx? There is no need to wait. Resubmissions can be processed as new documents are received. Populate resubmissions can make use of the resubmit button on the Client Details page. Organize and Organize Lite resubmissions must be submitted as a new returns. Q: How do I delete the client and associated files from GruntWorx? Once you’ve downloaded your processed files, click first on the checkbox to the left of the client name(s). Then, from the top right, select the “Batch Actions” dropdown, then “Delete Client(s)”. You can also delete the client from the Client Details page using the “Delete-Reset-Resubmit” dropdown. Q: I have a question about client data that was organized by GruntWorx. What is the best way to send my client's data to you to resolve this question? I have a question about client data that was organized or populated by GruntWorx. What is the best way to send my client’s data to you to resolve this question? If you have questions about client data that is being organized or populated by GruntWorx, please contact our Customer Support department by telephone (1.877.830.6059 x3) or email (support@gruntworx.com). NOTE: If you choose to contact us via email or web form, please DO NOT include or attach client data, as email is not secure. Q: I received a message that states the PDF file I uploaded isn’t good… what happened? There are two common reasons why a PDF file will fail: password protection and page corruption. Password Protection: PDF files that have password protection will fail. If you remove the password protection, you can “reset” the failed client and submit the PDF as a new job. Find the “Reset” button at the top of the Client Details page to clear the bad document and reset the client for a new submission. Occasionally, even though you have not added password protection, a document that you have downloaded from your client or from a portal, can have password protection. If you can’t remove the password protection, the original documents will be need to be rescanned or printed at best quality and scanned at 300dpi, black and white and substituted for the password protected pages before it can be processed. Corrupted Pages: PDF files that include corrupted pages will fail. If the file can be opened, the problem page(s) can most often be found by viewing each page of the document. Removing the problem page(s) does not always fix the corruption so you will need to, rescan the original documents at 300dpi, black and white and submit again. Q: When I download the file and ‘print-to’ my DMS, why do I lose the bookmarks? Q: I signed up for GruntWorx, but I didn't receive a registration confirmation email. What happened? Sometimes email filters from some email accounts will interpret a registration email as ‘junk’ mail, so please check your junk or spam email folder for the registration email from GruntWorx. Q: I can’t log in to the website (404 error), what should I do? An interruption in internet service may cause a GruntWorx login error. Follow the directions below to clear your cookies. Once cleared, you should be able to log in. 1. With your browser open, select the three vertical dots to the right of the address box at the top of your screen. 2. From that dropdown, select “More tools”, then select “Clear browsing data”. 3. In the “Clear browsing data” box, click the checkbox for “Cookies and other site and plug-in data”. 4. Select the period of time for the cookies to be cleared. You can use this setting to approximate the time when you lost internet. 5. To complete the process, click “Clear browsing data” at the bottom of the dropdown. 1. With your browser open, select the three horizontal dots to the right of the address box at the top of your screen. 2. From that dropdown, under “Clear browsing data”, select “Choose what to clear”. 4. Select Clear to finish. 1. With your browser open, select the three vertical lines to the right of the address box at the top of your screen. 2. Select the “History” tab. 3. Select “Clear Recent History”. 4. Select “Time range to clear”. 6. Select “Clear Now” to complete. 1. With your browser open, select the gear icon to the right of the address box at the top of your screen. 4. On the next panel, check “Cookies and website data”. Q: I am an UltraTax, ProSystemfx or a Lacerte user and my Populate job “failed to collect proforma”, what do I do? •	Make sure your client exists in the tax software, either rolled from the prior year or added with at least minimum information required. See the Quick Start Guide for required fields. •	Make sure the ClientID on the GruntWorx Dashboard matches exactly the ClientID in your tax software. •	Chrome browser: At first submission, users of Chrome must tell the browser what to do with the proforma file collected from the tax software. Once set, you shouldn’t need to do it again. After you select “Process” look immediately in the lower left of the browser screen for a download. 1. Click on the arrow at the right of the rectangular button to open a drop down menu. 3. Double-click the button itself to upload the proforma. •	Contact Support at 877-830-6059 X3 or by email to Support@gruntworx.com. Q: My GruntWorx job has failed, how do I submit again? •	From the Client Details Page click on the “DELETE-RESET-RESUBMIT” dropdown located upper right of the screen and select “Reset Client”. •	From either the Dashboard under the “Batch Actions” dropdown, or from the “Client Details Page” “DELETE-RESET-RESUBMIT” dropdown located upper right, delete the client. Q: I have already processed a file for my client but they brought me additional documents, how do I resubmit? •	From the Client Details Page click on the “DELETE-RESET-RESUBMIT” dropdown located upper right of the screen and select “Resubmit Client”. •	Create a new client with a new ClientID and process as you would a new job. Q: I need to prepare a prior year (non-current) tax return, How can GruntWorx help? GruntWorx will process Organize and Organize with Trades returns for any tax year. Only current tax year returns are supported for population. Q: I submitted an Organize LITE job, why isn’t the bookmarked PDF repaginated? Although you can specify repagination on the User Setting Page of the Dashboard, the repagination option is available only with the Organize and Populate products. Organize LITE is a low-cost, quick turn-around product that does not support repagination. Q: My PDF is failing when I try to upload it. What do I do? ·Refresh the page to see if you are logged out. As a security measure, you will be logged out after a period of inactivity. To fix: log back in. ·Check to see if the PDF file size is greater than 150MB. To fix, split the PDF into 2 or PDFS. ·If the file name includes an apostrophe, $ or other special character, please rename the file without that special character and retry. E.g. : O’Reilly.pdf should be renamed to OReilly.pdf.